Tramadol/acetaminophen has a risk for abuse and addiction, which can lead to overdose and death. Tramadol/acetaminophen may also cause severe, possibly fatal, breathing problems. To lower your risk, your doctor should have you take the smallest dose of tramadol/acetaminophen that works, and take it for the shortest possible time. See also How to Use section for more information about addiction. The risk for severe breathing problems is higher when you start this medication and after a dose increase, or if you take the wrong dose/strength. Taking this medication with alcohol or other drugs that can cause drowsiness or breathing problems may cause very serious side effects, including death. Also, other medications can affect the removal of tramadol/acetaminophen from your body, which may affect how tramadol/acetaminophen works. Be sure you know how to take tramadol/acetaminophen and what other drugs you should avoid taking with it. See also Drug Interactions section. Get medical help right away if any of these very serious side effects occur: slow/shallow breathing, unusual lightheadedness, severe drowsiness/dizziness, difficulty waking up. Children younger than 12 years should not use products that contain tramadol. Children between 12 and 18 years old should not use tramadol after certain surgeries (including tonsil/adenoid removal). Also, tramadol use is not recommended for children between 12 and 18 years old who are obese or have breathing problems. Some children are more sensitive to tramadol and have had very serious (rarely fatal) breathing problems such as slow/shallow breathing (see also Side Effects section). Talk with your doctor or pharmacist about the risks and benefits of this medication. Who should not take Ultracet? This product is used to treat moderate to moderately severe pain. It contains 2 medications: tramadol and acetaminophen. Tramadol is similar to opioid (narcotic) analgesics. It works in the brain to change how your body feels and responds to pain. Acetaminophen is used to relieve pain, and it can also reduce a fever. Read the Medication Guide provided by your pharmacist before you start taking tramadol/acetaminophen and each time you get a refill. If you have any questions, ask your doctor or pharmacist. Take this medication by mouth as directed by your doctor, usually every 4 to 6 hours as needed for pain relief. You may take this drug with or without food. If you have nausea, it may help to take this drug with food. Ask your doctor or pharmacist about other ways to decrease nausea (such as lying down for 1 to 2 hours with as little head movement as possible). The dosage is based on your medical condition and response to treatment. To reduce your risk of side effects, your doctor may direct you to start this medication at a low dose and gradually increase your dose. Follow your doctor's instructions carefully. The maximum recommended dose is 8 tablets per day. Do not increase your dose, take the medication more frequently, or take it for a longer time than prescribed. Properly stop the medication when so directed. If you have ongoing pain (such as due to arthritis), your doctor may direct you to also take long-acting opioid medications. In that case, this medication might be used for sudden (breakthrough) pain only as needed. Other pain relievers (such as naproxen, ibuprofen) may also be prescribed. Ask your doctor or pharmacist about using tramadol safely with other drugs. What conditions does Ultracet treat? Tell your doctor right away if any of these unlikely but serious side effects occur: mental/mood changes (such as agitation, hallucinations), severe stomach/abdominal pain, difficulty urinating, signs of your adrenal glands not working well (such as loss of appetite, unusual tiredness, weight loss). Get medical help right away if any of these rare but seriousfainting, seizure. Tramadol is changed into a strong opioid drug in your body. In some people, this change happens faster and more completely than usual, which increases the risk of very serious side effects. Get medical help right away if you notice any of the following: slow/shallow breathing, severe drowsiness/difficulty waking up, confusion. A very serious allergic reaction to this drug is rare. However, get medical help right away if you notice any of the following symptoms: rash, itching/swelling (especially of the face/tongue/throat), severe dizziness, trouble breathing. List Ultracet side effects by likelihood and severity. Before taking this product, tell your doctor or pharmacist if you are allergic to tramadol or acetaminophen; or if you have any other allergies. This product may contain inactive ingredients, which can cause allergic reactions or other problems. Talk to your pharmacist for more details. Before using this medication, tell your doctor or pharmacist your medical history, especially of: brain disorders (such as head injury, tumor, seizures), breathing problems (such as asthma, sleep apnea, chronic obstructive pulmonary disease-COPD), kidney disease, liver disease, mental/mood disorders (such as confusion, depression, suicidal thoughts), personal or family history of a substance use disorder (such as overuse of or addiction to drugs/alcohol), stomach/intestinal problems (such as blockage, constipation, diarrhea due to infection, paralytic ileus), difficulty urinating (such as due to enlarged prostate), gallbladder disease, disease of the pancreas (pancreatitis), obesity. This medication passes into breast milk and may rarely have undesirable effects on a nursing infant, such as unusual sleepiness, difficulty feeding, or trouble breathing. Breast-feeding while using this drug is not recommended. Consult your doctor before breast-feeding. What should I know regarding pregnancy, nursing and administering Ultracet to children or the elderly? Some products that may interact with this drug include: certain pain medications (mixed opioid agonist-antagonists such as pentazocine, nalbuphine, butorphanol), naltrexone. Other medications can affect the removal of tramadol from your body, which may affect how tramadol works. Examples include quinidine, azole antifungals (such as itraconazole), HIV drugs (such as ritonavir), macrolide antibiotics (such as erythromycin), rifamycins (such as rifampin), drugs used to treat seizures (such as carbamazepine), among others. Does Ultracet interact with other medications? Should I avoid certain foods while taking Ultracet? If someone has overdosed and has serious symptoms such as passing out or trouble breathing, give them naloxone if available, then call 911. If the person is awake and has no symptoms, call a poison control center right away. US residents can call their local poison control center at 1-800-222-1222. Canada residents can call a provincial poison control center. Symptoms of overdose may include: slow/shallow breathing, nausea, vomiting, loss of appetite, sweating, slow/irregular heartbeat, stomach/abdominal pain, extreme tiredness, yellowing eyes/skin, dark urine, seizure, coma. Store at room temperature between 59-86 degrees F (15-30 degrees C) away from moisture. Keep all medications away from children and pets. 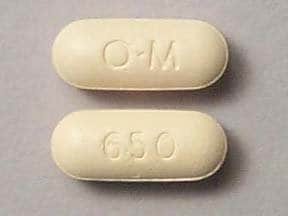 This medicine is a light yellow, oblong, film-coated, tablet imprinted with "O-M" and "650". Are you considering switching to Ultracet? How long have you been taking Ultracet?